There are three primary styles of snow blowers, single-stage, as shown in Figure 1, two-stage, as shown in Figure 2, and electric. Each has its own features which provide advantages and disadvantages depending on your geographic location and circumstances. While it is impossible for us to tell you which snow blower is best for your circumstances the following information should allow you to make an informed decision. Selection of snow blowers . 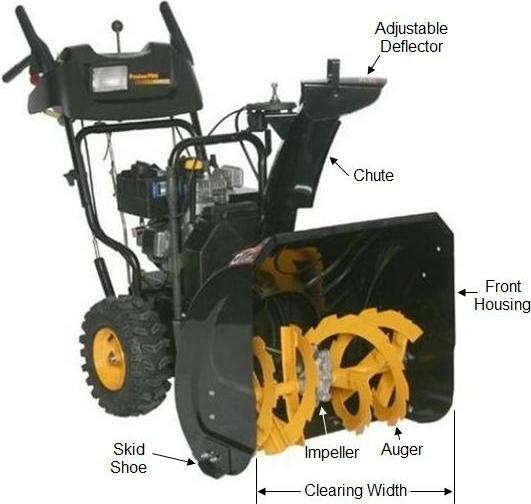 As with many products, snow blowers have their own unique set of terms that are used to describe the basic unit as well as the features. In order for you to make that informed decision on which snow blower is best for you, it is important that you understand the snow blower industry terminology. The individual parts are identified in Figure 2. The auger is the mechanism that collects the snow. It is mounted in a horizontal position and when power is applied it rotates. As the auger rotates it collects the snow in the front housing and directs it towards the exhaust chute of the snow blower. In a two stage snow blower the auger is deemed to be the first stage. The exact design of the auger is one item that separates one manufacture from another. The curvature of the auger blades, the angle of operation and any coatings applied to the blades are just a few of a specific manufacturer’s features. The chute is the mechanical assembly that directs the collected snow away from the snow blower. From its location behind the auger housing, it can be adjusted to direct the snow in most any direction. The clearing width of the snow blower is the width of the swath it takes on each pass. In most cases the clearing width is relative to the size and type of engine on the snow blower. For snow blowers five horsepower and less the maximum clearing width is usually less than 21 inches. 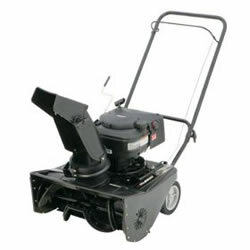 For snow blowers with engines from 5 to 13 horsepower a clearing width of up to 36 inches are available. When shopping for a snow blower be careful when comparing clearing width. A wider clearing width on a smaller horsepower engine may look advantageous because of the price. But the engine may have to work too hard to clear that width of snow. The deflector sits on top of the chute and provides an adjustment that will change the arc of the discharged snow, which in turn will determine where the discharged snow will actually land. Depending on the model and manufacture, some deflectors can be controlled by cable from where the operator walks the snow blower while others can only be adjusted by physically adjusting the deflector’s position.